(Cleveland, Ohio) Joseph Robert Cortese died peacefully on Thursday December 7th 2017 at Maplewood Assisted Living Community. He was 90 years old and, until recently, was living independently in Chagrin Falls, Ohio. He was born on May 30th 1927 in Youngstown, Ohio to parents Clara Dorko and Dominic Cortese. He attended the local public schools in Youngstown, graduated from Chaney High School in 1946 and excelled in his academic work in addition to managing his school basketball team. He survived his sister Louise whose husband Paul E. Wilson lives in Monterey, California. His nephew Paul Wilson, married to Kathy, and father of Shelby and Noah, lives in Castroville, CA. He attended The Ohio State University, graduating with high honors in all subjects. Joe was a bright student, forever seeking knowledge in all areas. He remained well-versed and intellectual even through his final years. He made it his goal to be fully informed on all fronts. At OSU, he became an avid fan of his beloved Buckeye Football Team. Joe wore his scarlet and gray tie at many occasions. His team never let him down, even through the non-Bowl years and he would later in life, be an extremely proud grandfather of a Buckeye placekicker. Joe went on to shine at Harvard Law School where he graduated in 1952, having served on the Law Review Board and where he developed a keen acuity and interest for the practice of corporate law. His drive toward excellence never faltered; he graduated at the top of his class and was immediately hired as an attorney at the esteemed law firm Squire, Sanders, and Dempsey, in Cleveland, Ohio. Joe joined the law firm in 1952 and spent his entire professional career there. As one of the nation's preeminent public finance lawyers, Joe was a trusted advisor and counselor to James A. Rhodes and several succeeding Ohio governors. In that role, he created the financing infrastructures for Ohio's higher educational and healthcare systems, and its department of development. His work was widely replicated in other states. Joe did not simply "think outside of boxes"- he created new ones, and was a solution-oriented mentor to generations of firm lawyers. There he practiced and thrived representing clients such as Standard Oil and Honda Corporation. He developed a unique and valuable expertise in his field and was respected world-wide for his specialties. He traveled the country and Europe to his law office branches to share his time and talent for this unique specialization. He married Julia Dechant Fitzsimmons on June 20th 1964 and enjoyed a marriage that lasted 50 years. Julia's four children were part of the union and "Dad" helped to raise them from youngsters through adulthood, always supporting their efforts and achievements. They are Samuel Dechant Fitzsimmons; wife Mary Owen (Baltimore, MD), Elizabeth Fitzsimmons Barclay; husband David Barclay (Denver, CO), Carol Fitzsimmons Sargent; husband Manny Sargent (Walpole, MA), and Sarah Hartman Fitzsimmons; husband Richard Schoenberger (Los Angeles, CA). He lived to enjoy the birth of seven grandchildren, Devin Michael Barclay (Portland, OR), Rebecca Sargent McLean (Walpole, MA), Colin Joseph Barclay (Denver, CO), Anne Comly Sargent (Watertown, MA), Lucius Manlius Sargent IV (Quincy, MA), Johanna Fitzsimmons (London, ENG), and Samantha Fitzsimmons Schoenberger (Los Angeles, CA). They fondly called him "Pop-Pop." 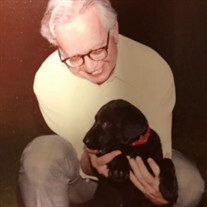 He did not have the opportunity to meet his five great grandchildren but kept up with their growth and progress through phone calls, letters, and photographs. Judy and Joe traveled extensively during their marriage; their international trips took them to France, Scotland, Italy, Hungary, and China to name a few. Together with friends and a close sister and brother-in-law (Dorothy and Thomas Hughes), they absorbed the many countries' histories and cultures and shared these experiences with their growing families. Joe loved dogs. He added Puppy to the brood, a beloved mutt who was fondly accepted. Cats were also part of the Fitzsimmons menagerie. By far his favorite canine was Sophie, a Black Lab who became his pace car as he bicycled around the Shaker Boulevard green spaces. He welcomed all his visiting "granddogs" at every holiday celebration. He was also fond of his roses and his garden in general. His green thumb created the perfect backdrop for three family weddings over the course of his children marrying. He also liked to tinker in the workshop and fancied himself a good repairman and expert tool collector. Joe has been cremated and joins his wife in the columbarium at St. Paul's Church in Cleveland Heights, Ohio. The family will honor him privately.